from a book written of mrs. rampa - the lady that the former lama had to share his life with. She apparently wrote some - 4 - books on their daily life - this is from the book HERE book TIGERLILY written by "mrs.rampa"
.....I will stay with ghosts . . . which seem to be more my forte. whom I had recently been chatting in an office. eyesbeing riveted on their brightness. find it strange — but just something of extreme interest. unseen entities who came to assist in his passing. and wore an attractive headdress, and a coat light in color. sel, not discussing other people's affairs to their detriment. Not to talk too much and not to tell everything you know. I have tried to follow this advice and sometimes it has been a great strain to refrain from saying, ‘Oh I know about that; I will tell you.’ But then I kept my counsel and I really find it interesting — to observe but to say nothing can be fun. People don't know how much you know and so they will tell you even more. The Guv says that if you tell all you know, the other person will think you know even more, and then you have to work harder not to disappoint him. I am reminded of one case in particular where a man talked too much of other people's affairs. He had recently become the manager of a bank and apparently he dis- cussed the accounts of one person with another. When it became known what was happening (after someone com- plained), well, the poor man was demoted. No, this did not happen in Canada. own business, the giving of one's time, one's under- standing, one's forgiveness, can bring joy to the recipient and contentment to the giver. Even one's material goods. If we have two of something, why not give one to some- one who is without — if he can use it? Many people have commented upon the Guv's extreme kindness in this re- spect and I will go so far as to say that, if he had only one of something and another person needed it he would pass it on to the other person. Unlike many of us, he does not give away only the things for which he has no use. He gives that which he treasures if he sees someone wants it. It is his belief, and mine too, that if a person desires one of your possessions, that person puts his ‘impression’ on it, so in a way you have lost it; and the only thing to do is to hand it over; otherwise, every time you look upon it you will sense (unless you ‘see’ as the Guv does) the would be owner's ‘impression’ and you will no longer enjoy that particular possession. So why have two dis- satisfied persons? Better to give it away. (3) TO DISCIPLINE ONE'S SELF. . . The difference be- tween rabble and a well controlled army is just a matter of discipline. Anyone possessed of average intelligence knows that training and reliability make a better person. Training consists merely of repetition, habit, or whatever we like to call it; and the first thing is to make a decision and stick to it. I have not met anyone who had so dis- ciplined himself as Lobsang Rampa. He will never allow his physical to overcome his mental state; and the more desperately sick he may feel he will get up from his bed to prove to himself that his ‘will’ is the master of his body. When I started to write these pages I felt the need to do something different and to work on it regularly, and I have found the discipline involved very beneficial. When I told Mr. Sowter I found writing very good therapy, he expressed surprise. He must have thought I was badly in need of therapy to adopt such stern measures. (4) T0 STAND ALONE. . . This, to many people, is probably the most difficult of all for, though we may have an independent nature, we do not like the idea of standing alone. The Guv has repeated over and over again that ‘everyone must learn to stand on their own feet for it is the only way to progress’. In the final analysis, NO ONE can escape; each one of us must account for himself. When on occasion I may have bemoaned the fact that life can be very lonely, I am told: ‘You don't know what loneliness is until you go away from your own people and your own land, with no hope of returning: How would you like to be mis-understood and maligned when all you were trying to do was to help poor struggling humanity?’ I have thought about it and decided that I could not bear that kind of loneliness. In my saner moments I re- alize that, after all, compared to the Guv my conception of aloneness is nonexistent. here you can download in ZIP the WHOLE book TIGERLILY written by "mrs.rampa" - here she writes about her former life - before her real husband left his body - and Lobsang got the task to use the same body in his mission in the spiritual ignorant westworld. This file is packed on winzip (142kb) and you must unzip it after downloading - its a wordfile. if you want to read more of the books written of mrs.rampa - you can write a mail to the address below - and ask if he will send you one or more books over e-mail. 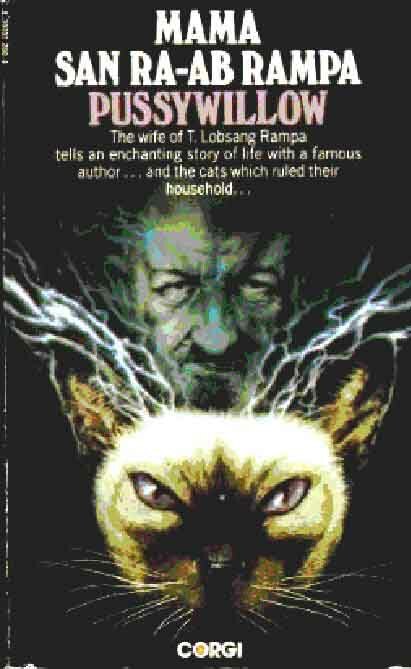 But it is to remark that her book does not much deal with supernatural themes like LOBSANG does - and as here touched- so the extract here is not adequate for the content - it is most about their cats and the daily life in different cities. They seemed to move much around in Canada always hunted by pressreporters and curious people, but also meeting kindly and helpful people.